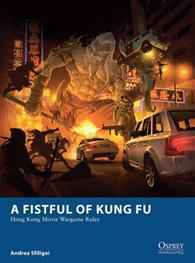 A Fistful of Kung Fu brings the hyper-kinetic, bullet-spraying, demon-slaying, kung-fu-fighting action of Hong Kong movies and Asian cinema to the wargames tabletop. In a modern world walking a precarious line between the advances of next-generation technology and the tradition and mysticism of ancient cultures, Kung Fu schools face off in no-holds-barred tournaments, corporations hire agents and spies to steal each other’s secrets, overworked SWAT teams respond to gunfights between feuding Triad and Yakuza clans, and ancient artefacts are sought by hopping vampires, demon sorcerers and cyborgs alike. Combining the gunfights of John Woo’s Hard Boiled, the hand-to-hand combat of Enter the Dragon, the sheer mystical weirdness of Big Trouble in Little China, the wuxia action of Crouching Tiger Hidden Dragon, and everything in-between, A Fistful of Kung Fu is a skirmish wargame unlike any other.